Gutters are probably the one part of a house that most homeowners overlook, which is surprising because gutters perform an important function in protecting your home. Gutters keep excess water away from your roof and catch debris that might otherwise clutter your yard. Do not make the mistake of thinking that gutters will clean out on their own. They won’t, no matter how strong the rain is! Below are some important gutter maintenance tips that you can use to make sure that your gutters continue to do their job for years to come. Debris like leaves and sludge can gradually destroy your gutters without you even knowing it! If your gutters are filled with debris, wear a pair of protective gloves and pull everything out with a handy gutter scoop. If the material is stuck or encrusted, use a heavy-duty brush to loosen the sludge. You should then hose down the gutters to clean them out completely. Also, don’t forget to check for clogged gutter guards and drain pipes as well. They will be less efficient in collecting and guiding water if they remain blocked. The best way to maintain your gutters is to clean them out regularly. 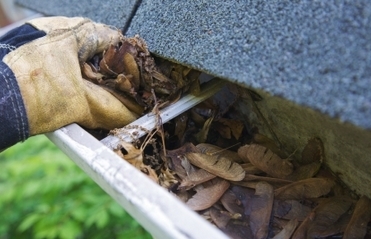 If your gutters catch dead leaves, twigs and branches, perform cleanups about three to four times per year. If your gutters catch mainly rainwater, clean them out twice a year. You can also perform visual check-ups in once every season. If there are any problems, you will be able to easily spot and correct them right away. After severe storms, check your gutters for any holes or damage. If there are loose portions, secure them into place. If you have to replace large portions of your gutter, these gutter holders will give you an extra set of hands! Don't wait until the damage worsens before fixing your gutters. By then, it will be too late to save what you have and you will spend more on repairs! Gutters keep rain water away from the walls of your house and guide them away from your foundation. Inspect the length of the gutters for any rusted areas, holes, dents and scratches. Rust will eat away at the metal over time, and it will lead to holes, which will render your gutters useless in keeping water and debris away. As soon as you spot any damage, perform corrective gutter maintenance right away. Sand out the rusted area, and paint over it. You could also apply an anti-rust product to keep the rust from spreading. Patch out any holes and scratches if they are still minimal. If not, get these portions replaced with new pieces. We hope that these gutter maintenance tips help! AJC Tools has a full line of gutter tools all available for online purchase. Check them out today!